I think it was done many times before, but the question often tiredly get asked and always a new answer is given every so often. Let's ask it again shall we? 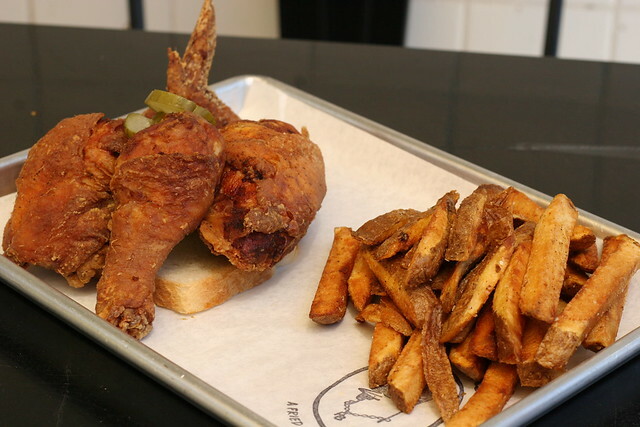 Where can you find the best fried chicken in LA? You get that question a lot, don't you? Probably more times than you can remembered and I obviously changed my answer every few months when I visited a new place for fried chicken. 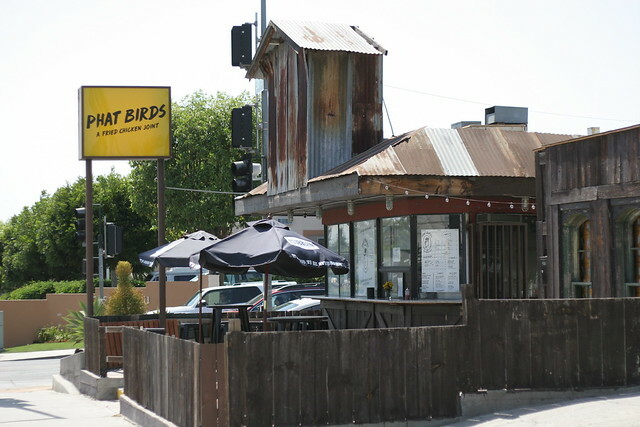 One of the best spots that stuck to my mind since my initial visit sometime last fall was this quiet little place near a metro rail station in East LA called Phat Birds. Pronounced like "fat", but slang translation meant "excellent" or "cool". Luckily they went PC and not called themselves Phat Chicks or a riot would have started for sure. I think I have done a few chicken shack like Crack Shack and Gus's World Famous Fried Chicken. This unique spot was I discovered from a list belonging to a traveling "advisor" site.... ie Yelp for travelers. Pleasantly, it actually exceeded even my wildest imagination. Usually on a boring weekend, I can make a trip and park it near residential area as parking lot does not exists. Keep on that in mind if you decide to come on a weekend evening where a party can happened and takes up all of the neighbors space as well. Cute little remodeling of this shack where it showed what might be an older food stand that reworked into a subtle outdoor picnic patio for the masses. Another sure sign this is legit is the cooker in the back of the stand where I can see where the fryer are being kept for churning out these fried chickens. To the point, they offered three offers of flavor with two size orders. The flavors are either be traditional (original for most people), Honey Dipped, or Nashville Hot Fried. The sizes comes in a quarter size (legs and thigh / breast and wing) or half size (which include all four parts). My favorite among what it was offered was the Honey Dipped flavor fried chicken. I think it's like traditional, but then dipped in their special honey with a side of fries and pickle with a slice toast. At my last trip, I was able to get their traditional without any sauce and still enjoyed this juicy tendered fried chicken that was in store for me. If it was up to me, I would choose the honey dipped. Somehow I liked the fries so much and got that again for the half chicken. If I get adventurous enough, Nashville hot would be next. That required gutsy move on my part. There are also new items being introduced since my initial visit last year that made its way this year was the housemade chicharrones and corn fritters. Both of the items needs to be explored next time along with the Nashville hot version of their fine fried chicken. 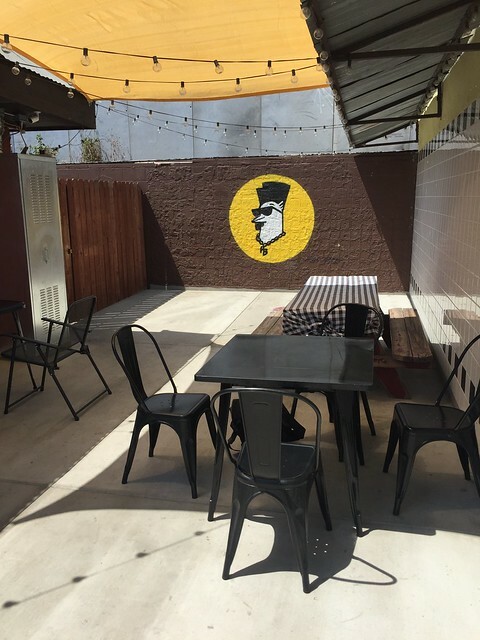 East LA is a burgeoning area that is getting more popular as hipsters are making its way east past downtown and Silverlake. Not surprisingly.... you can guess a lot of people who don't live in this area are making a trip to get these chickens just like I'm doing on that warm afternoon. One observation I have noticed is that many of the chicken places tends to be in a parking lot of a pre-arranged agreement with certain property owners to operate a limited hours schedule. We can named a few fried chicken specialists are doing this. This location gave a good blue print on how to grow the business without the need to have a brick and mortar retail space and still thrives. Is this debate settled? This place is right up on the discussion and probably will outlive many others for the near future.